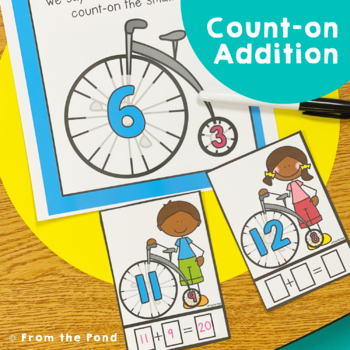 This printable resource set includes detailed instructions, poster chart, game cards, worksheet and a cover page, to help you teach the counting-on strategy to your students. The game cards are 'write and wipe' - although you can use the cards in conjunction with the provided worksheet and not use the writing section (students just record on their worksheet only). 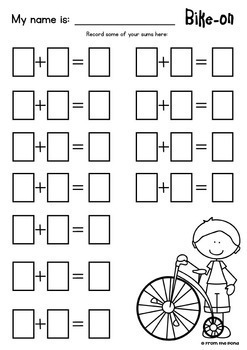 Students should start learning to count-on once they have learned how to find the total of two groups by counting all the objects. 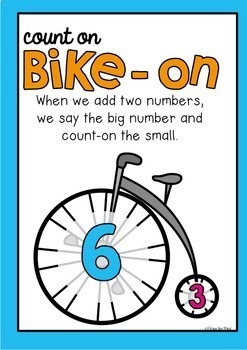 Our poster charts provides a helpful reminder for students to "say the big number and count-on the small" and a visual support. 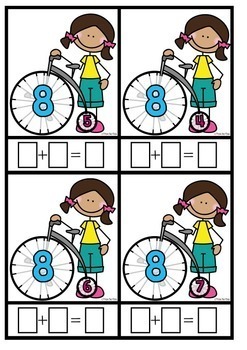 Tell your students that when they see two numbers in the future, they must think of which number would go on the 'big wheel' that always comes first on the bike. You will need to laminate these cards and use dry-erase markers to play with them. The addition sums are 20 or less. 32 game cards are included.